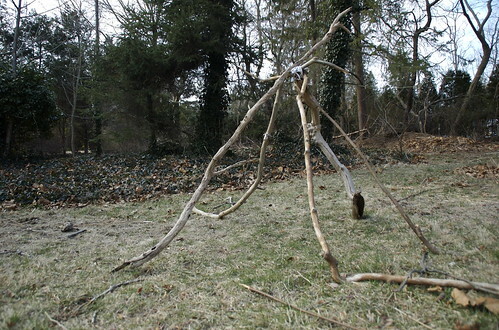 Shortly after we moved here, Maggie began collecting large branches from around the garden to construct a teepee. Mornings after windy nights start with an eager hunt for branches newly fallen from the huge tree that towers over our house. When friends come by for a visit throw rugs and huge blankets are dragged out to transform her structure into a convenient, and cozy, spot to hide away from pesky little brothers. The kids picked up some morning glory and sweet pea seeds from the garden center yesterday … I’m wondering if Maggie might like to use one or the other to turn her teepee into into a living tent when the weather grows warmer? I am beyond excited that my little one has been so into “tents” lately. 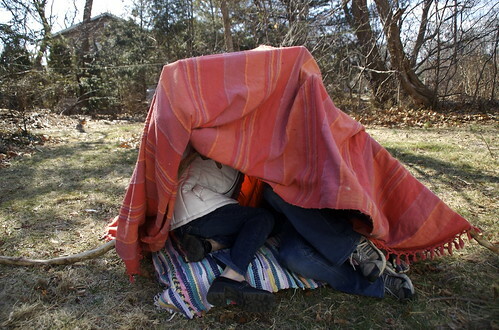 I think it is because some of my fondest memories revolve around camping in blanket sculptures in our backyard. WHat a great teepee! I just borrowed this book from the library, Roots Shoots Bucket and Boots by Sharon Lovejoy, that showed how to make the cutest living tent using bean plants. When we finally move to our new house in the country I want to make one!